The racing is in full swing in Saint Tropez. The Race Directors of the three race zones that make up Les Voiles have once again managed to cope brilliantly with this rather unique weather phenomenon that causes an unpredictable ENE’ly wind to blow off the shores of France’s Var department. As such, coastal courses were able to be launched at midday across all the classes, Wallys, Modern and Classic yachts. Fluctuating a great deal in terms of strength and direction over the course of the afternoon, the E’ly breeze shuffled up some of the cards in the different rankings and offered a picture postcard finale when the futuristic Maxi yachts and other Wallys shifted into the gulf and melted into the Classic yachts. With this new race validated for each of the competing groups, and on the eve of the last racing tomorrow, there is still everything to play for, particularly with some of the big names choosing today to falter. In this way, several groups will have to wait until the final tack of the final race to reveal their winner. Tango, finally! Magic Carpet3, the 2013 Reichel Pugh design is clearly giving her all to get her revenge over the Wallys and the 80-foot Lyra in particular, winner in 2017. However, the latter isn’t giving an inch, even taking another win in corrected time today during the coastal course towards Cavalaire. Launched in very light airs at midday, the race gained in volume throughout the day, the NE’ly wind building to over ten knots, enabling some of the outsiders to show what they were made of. This was the case for the dark and magnificent Tango, which sailed a great race from beginning to end and won in elapsed time. Magic Carpet3 has had to make do with third place, creating great suspense on the eve of the decisive last race tomorrow, Saturday. Cannonball reaps the benefits in IRC A The much-awaited Maxi Rambler (Kouyoumdjian 2011) and the keenly observed My Song, (Baltic 130) kept bang on track in the light airs today, respectively finishing 2nd and 1st in the 21-mile course off Cavalaire. The leader of the provisional overall ranking Cannonball, despite a fairly average race, is set to benefit from her direct rival Jethou being over the line at the start to consolidate her lead. Of note, are the fine performances posted by the two J Classes Velsheda and Topaz, at the front of the pack throughout the light airs race. The Mylius 80 Twin Soul B also managed to show off her true potential in a complicated wind range. A misstep for Gladiator Very much into her stride to take the win in the Edmond de Rothschild Trophy among the IRC Cs, the fabulous and formidable British TP 52 Gladiator stumbled today with a lacklustre 14th place. And yet Tony Langley’s men had done their best, nailing the win in elapsed time ahead of Arobas, their main rival. However, they simply were not quick enough to smooth out their handicap in corrected time. Classics: place your bets With the threat of a boisterous gale looming offshore of the Gulf, Race Management for the Classic yachts this morning chose to send the venerable competitors, often dating back over 100 years, towards Issambres, which is well protected from the gulf. In a most fickle breeze, the navigators’ nerves were really put to the test and there were numerous close-contact duels. In this way, within the highly prestigious group of 20 Fifes competing for the Rolex Trophy, a fantastic mano a mano ensued between three of the four 15 m JIs, Hispania, The Lady Anne and Mariska finishing the race in that order, mere seconds apart! However, today’s big winner has to be Carron II (1935), which joins Viola (1908) on the top step of the provisional podium. In brief The complexity of organising the races at Les Voiles! The 300-odd boats which make up the sublime fleet at this event in Saint Tropez are split into three very distinct big categories, the Wallys, the Modern yachts and the Traditional yachts. The Wallys, despite their different sizes, between 80 and 130-feet, race in the same class, the Modern yachts race according to their class rules in 5 IRC groups. The Classics, which represent over 130 years of yachting are, for the obvious reasons of fairness, split into no fewer than 13 groups, according to their size and rig type, namely gaff or Bermudan. 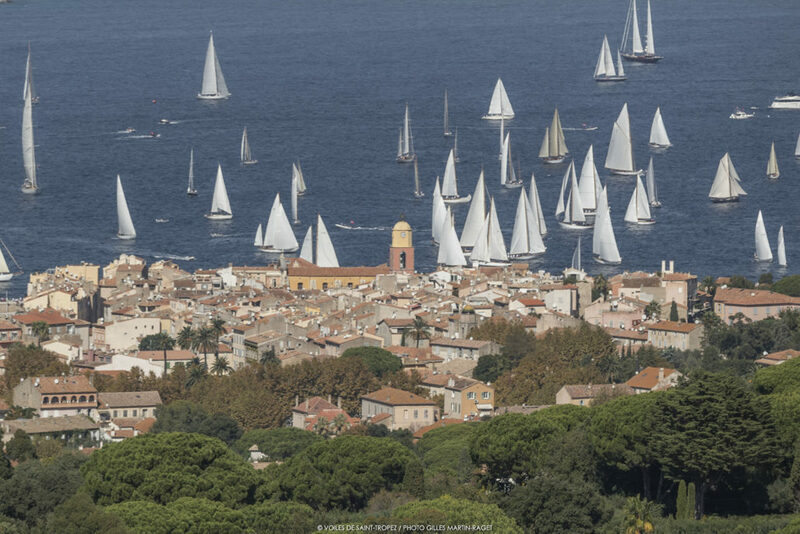 The difficulty for Race Management, presided over by Georges Kohrel, lies in organising attractive races every day of the week in Saint Tropez, offering the racers a wide variety of points of sail and preferably avoiding any concertinaing between the Classes. That is the daily miracle performed by the organisation teams at Les Voiles who, depending on the weather forecast, each morning choose the day’s courses for each of the three groups. The Wallys have their ‘round’ opposite Pampelonne, where they compete in either windward-leewards or coastal courses spanning twenty miles or so. The Modern yachts are positioned at the exit of the gulf, opposite Les Salins, whilst the venerable and much venerated traditional yachts take over the gulf, for the great delight of the numerous spectators, who can admire them from shore. And since we’re referring to the shore, THE big problem with the very enchanting gulf of Saint Tropez are the shallows. “When you design a course off Pampelonne” explains Georges Kohrel, the seabed suddenly shelves, going from 17 metres… to 1,000 metres!” And therein lies the complexity of setting the essential passage marks in conditions such as these. However, the committee teams do a superb job every day, adapting everything according to the wind and the sea state (waves of over 3m recorded today and yesterday!) to the types of boats and the potentials of the different classes, in order to launch these fine races which delight the 4,000 racers and the 260 journalists and photographers who come along to share this highly exclusive spectacle. Today’s partner Edmond de Rothschild Group An entrepreneurial spirit, daring and long-term investment are found in all Edmond de Rothschild’s domains, be they financial, philanthropic, lifestyle or even sports-related. A passion for innovation has always coloured and guided all our activities. It is this desire to push back the boundaries and commit as a team, which has enabled us to create a group like ours. At Edmond de Rothschild, each innovation is part of a long-term story: the Gitana saga is concrete proof of this as it refers to an historic line of boats which testify to the passion of a family driven by the taste for excellence. To be a partner of Les Voiles de Saint-Tropez, is an opportunity for us to hark back to Gitana’s historic victory. Indeed, during the 1984 edition, Baron Edmond de Rothschild won the legendary Nioulargue in the bay of Pampelonne with Gitana VIII and her skipper Harold Cudmore competing against the Maxi Coriolian IV skippered by Eric Tabarly. In this way, our partnership is perpetuating this family saga initiated in 1876. By returning to this legendary venue, we are keen to revive this tradition and share the taste for daring and excellence with our clients. Showcasing our pioneering spirit is what prompted Edmond de Rothschild to create and preside over the Class of Maxis in 1982 and then, 35 years later, launch the first offshore racing Maxi to fly in the open ocean. Each of our convictions is built over the long term and our search for performance is not restricted to financial matters, rather it is in every one of our domains. Les Voiles de Saint-Tropez is also synonymous with a certain elegance, a value cherished by the Rothschild family, which it has been able to modernize and enter into dialogue with through technological innovation. Enabling our clients to experience the Gitana legend from 1876 to 2018 is what we’re striving for here. Byblos The Byblos hotel is a French neo- Provençale -style palace located in central Saint Tropez in the Var. A mixture of myth and legend, the 5-star hotel hides behind its ochre and yellow façades a genuine little Provençale village away from the public gaze. Built and inaugurated by the Lebanese hotelier Jean Prosper Gay-Para in May 1967, it was bought up in 1967 by the businessman Sylvain Floirat, whose great-grandson Antoine Chevanne is the current chairman of the board. The hotel is open from April to October and closes its doors in winter. It boasts 91 rooms, including 50 suites. The Byblos secured the label “palace” on 28 June 2012.
http://www.lesvoilesdesaint-tropez.fr/les_voiles_de_saint_tropez/wp-content/uploads/18VSTD6_9246.jpg 1417 2126 SNST99@beauVAR-83 http://www.lesvoilesdesaint-tropez.fr/les_voiles_de_saint_tropez/wp-content/uploads/vdst2017siteOK.png SNST99@beauVAR-832018-10-06 17:33:442018-10-06 17:33:44Where else to sail! J’peux pas, j’ai les Voiles ! Retenir les Voiles !